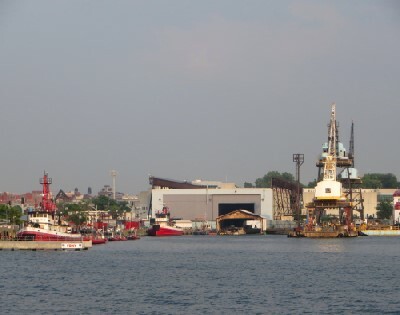 A tour of the historic Brooklyn waterfront, with the Working Harbor Committee. 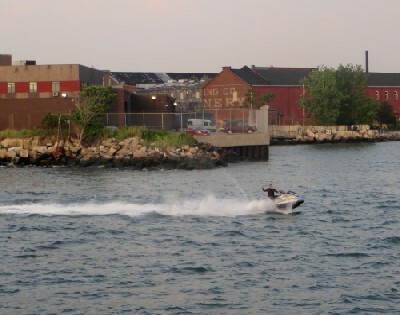 On June 11 my wife and I went on another of the Working Harbor Committee's "Hidden Harbor" tours. A year ago we took one that left from the west, or Hudson River side of Manhattan and went past lower Manhattan, through the Buttermilk Channel between Brooklyn and Governors Island, then across New York Bay to the Kill Van Kull, which lies between Staten Island and Bayonne, New Jersey. Passing under the Bayonne Bridge, we went into Newark Bay, where we saw the huge complex of piers and cranes and the container ships docked there. See a photologue here. 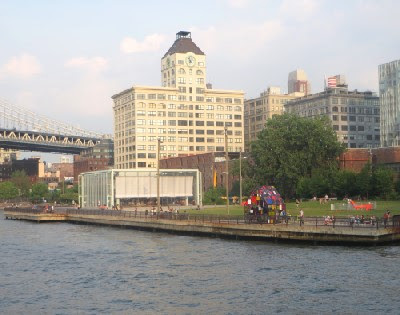 Last month's tour went from Pier 17, adjacent to the South Street Seaport on the Manhattan side of the East River just south of the Brooklyn Bridge, and focused on the Brooklyn waterfront. 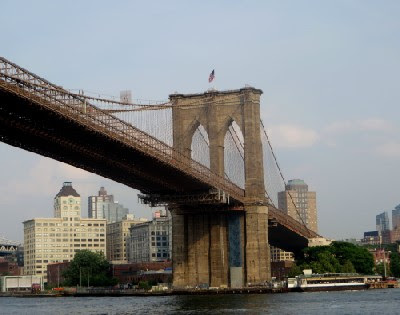 After leaving the dock we headed north, passing under the Brooklyn Bridge (John Roebling, 1883; photo above). 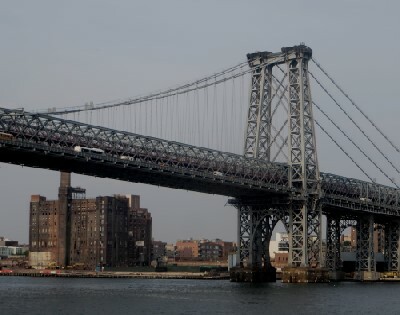 Shortly after, we went under the Manhattan Bridge (Leon Moisseiff, 1912). 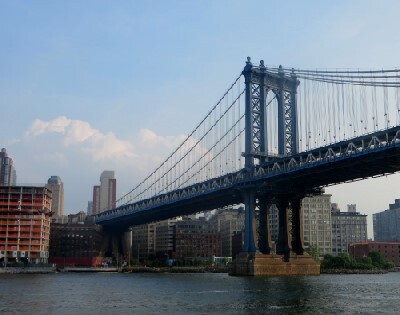 Behind the bridge is DUMBO ("Down Under the Manhattan Bridge Overpass), once an industrial area but now filled with art galleries and studios, high end retail, tech company offices, and mostly very expensive residences.Near the shoreline is part of Brooklyn Bridge Park; at left is an apartment building under construction, revenue from which will help to fund the park's maintenance. The self-unloading bulk carrier Sophie Oldendorff was discharging her cargo of crushed stone from Canada at the Brooklyn Navy Yard. The Yard opened in 1806, and from then until the mid 1960s built and serviced many U.S. Navy ships, including the battleships Maine, whose sinking in Havana harbor in 1898 helped to lead to the Spanish-American War, and Missouri, on whose deck Japan signed its surrender, bringing World War Two to a close. The Yard is now an industrial park controlled by a Development Corporation. In addition to docks and a ship repair facility, it is home to many industrial operations and to Steiner Studios, one of the largest production studios outside the Los Angeles area. Proceeding upriver (technically, the East River isn't a river, but a tidal strait connecting Long Island Sound and Upper New York Bay) we passed under the northernmost of the three bridges connecting Brooklyn to Manhattan: the Williamsburg Bridge (Leffert L. Buck/Henry Hornbostel, 1903). When completed, it was considered by many to be an eyesore; later aesthetic judgments have been kinder. Beyond the bridge in the photo above is the former Domino Sugar Refinery, now, like so many former industrial buildings along the Brooklyn waterfront, being converted for residential use. 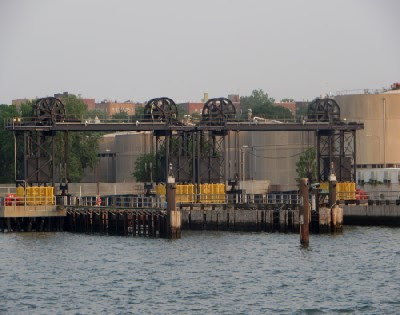 We went to the entrance of Newtown Creek, which serves as the boundary between Brooklyn and Queens. Returning to the Navy Yard, we passed a base for FDNY fireboats. 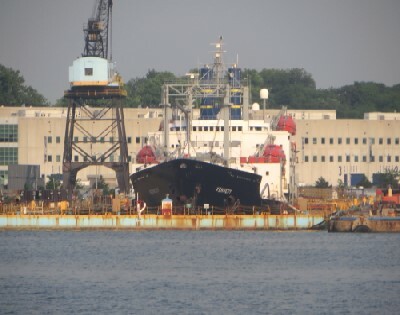 We also saw Kennedy, training ship for the Massachusetts Maritime Academy, in drydock for repairs. Continuing southward, we went under the Brooklyn Bridge again, then passed Jane's Carousel, in its pavilion designed by French architect Jean Nouvel. The colorful structure in the foreground is Tom Fruin's "Kolonihavehus." These are located in Brooklyn Bridge Park. The tall building in the background is One Main Street, formerly part of a cardboard box manufacturing complex and now residential. This is Fulton Ferry Landing, the Brooklyn terminus of Robert Fulton's steam powered ferry from Manhattan. The steam ferry began service in 1814, but oar and sail powered ferries had plied the same route since the mid 1600s. The steam ferry led to the development of Brooklyn Heights as America's first suburb. Although the Brooklyn Bridge was completed in 1883, ferries continued to operate until 1908. Their death knell was sounded by the subways. 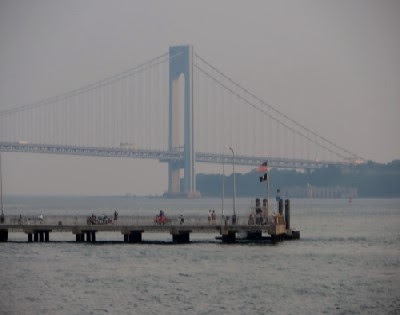 Today, ferry service is back and ferries to and from Manhattan, Governors Island, Queens, and other Brooklyn locations dock at nearby Pier 1 in Brooklyn Bridge Park. 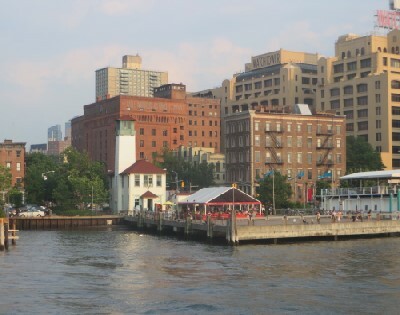 The white building with the tower is a former fireboat house, now occupied by the Brooklyn Ice Cream Factory. The red brick building at the right, with fire escapes, has at different times been a railroad headquarters and a toilet bowl factory, and is now apartments. The white vessel with the canopy tied to the pier at right is Bargemusic, a popular venue for chamber music concerts. The taller red building at center is the Eagle Warehouse, completed in 1893 and designed by Frank Freeman, a prominent Brooklyn architect who worked in the Romanesque tradition of Henry Hobson Richardson. The building was named for the Brooklyn Eagle newspaper, edited for a time by Walt Whitman, the headquarters of which had earlier been on the site. Today, like many other commercial and industrial buildings on or near the Brooklyn waterfront, it has been converted to residential use. 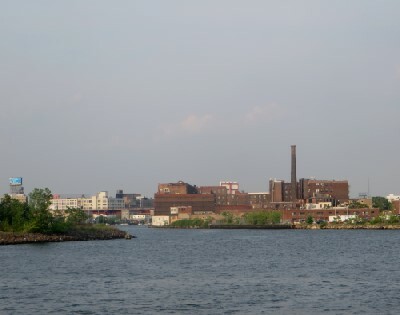 The tall beige buildings in the background were part of the Squibb pharmaceutical manufacturing complex, are now owned by the Watchtower Tract and Bible Society, better known as Jehovah's Witnesses, and used as part of their administrative and printing operations, As the Witnesses move their operations upstate, they are slated to be sold, no doubt for conversion to residential use. 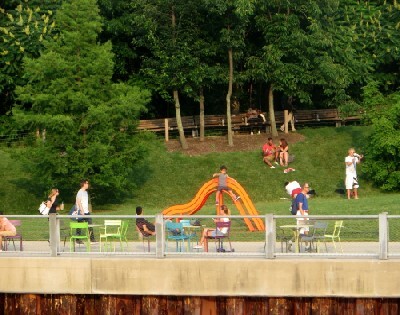 We passed Brooklyn Bridge Park's landscaped Pier 1 (these were former commercial shipping piers, now converted to parkland) and one of Danish artist Jeppe Hein's "Modified Social Benches," part of his "Please Touch the Art" exhibition. 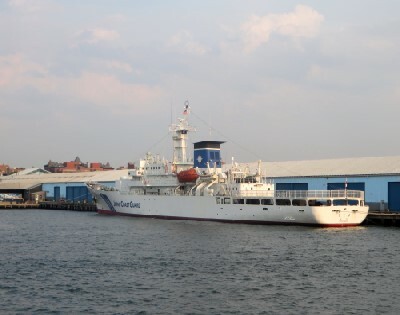 The Japan Coast Guard training ship Kojima (PL 21) was docked at Pier 7, just south of Brooklyn Bridge Park. 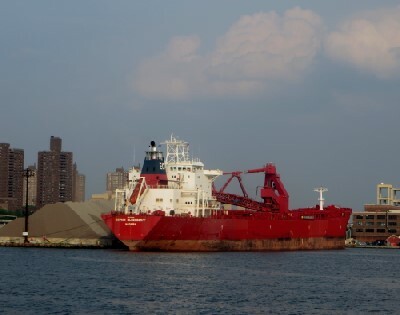 Laura, a small container carrying freighter, was at the Red Hook Container Port. The demise of this small port has been predicted for some years, as it lacks a railhead and vast acres of storage space, but most importantly, it sits on waterfront land desirable for residential development. 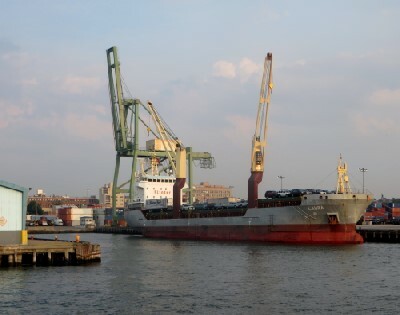 Plans for expansion of container port operations in Brooklyn may save it. Here we're entering the Erie Basin, named for the fact that it was where schooners laden with Midwestern grain discharged their cargo into grain elevators which then loaded them onto oceangoing ships that carried it overseas. The schooners got the grain in Albany, transshipped from Erie Canal barges (hence "Erie Basin") and carried it down the Hudson River. The barges had gotten it in Buffalo from ships that carried it eastwards through the Great Lakes. The Erie Basin area has many nineteenth century warehouse buildings. 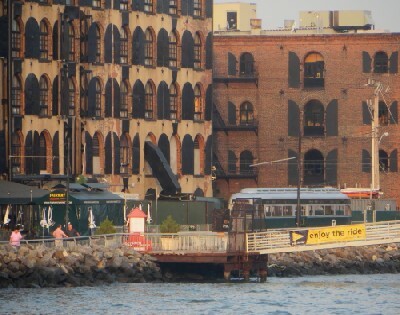 The one on the left houses a supermarket on the ground floor; the one on the right has been used for art shows, and the trolley car in the foreground is of the PCC type previously used in Brooklyn. This retired Lehigh Valley Railroad barge is now a waterfront museum. After passing Erie Basin, we came close to the famous (or should it be infamous?) 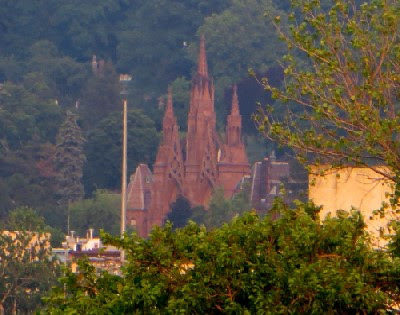 Gowanus Canal; from there I got this long-lens shot of the elaborate Gothic entrance to Green-Wood Cemetery. 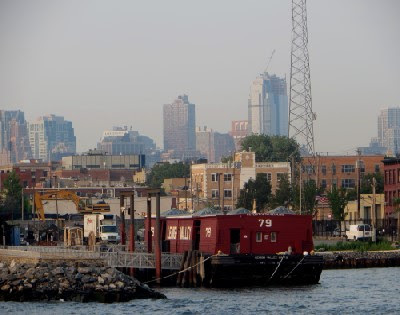 Continuing southward, we saw the docks where barges from New Jersey load and unload freight cars destined to or from Long Island or New England. Looking south, we could see the Verrazano-Narrows Bridge (1964), connecting Brooklyn and Staten Island. From here, we returned to our dock in Manhattan. TBT: The Grateful Dead, "Cumberland Blues." I am not now, nor was I ever, a Deadhead. I will confess--it is a confession, as I have some friends among the rock cognoscenti who make hatred of the Grateful Dead a kind of verbal secret handshake--that I do like, indeed like very much, some of their stuff. Since they officially disbanded last week, this seems a good time to acknowledge that. Workingman's Dead is an album I love. All right, I love it mostly because it was the first music I heard after a terrifying ride, helmetless, on the back of a friend's motorcycle along California's coast and cliff hugging Highway One for about twenty miles ("How fast were we going?" "Oh, about eighty on the straights.") in October of 1970. After we re-crossed the Coast Range and headed back into Palo Alto, we stopped at the house of a friend of my friend, who greeted us warmly and invited us in where his wife provided a bottle of liebfraumilch and a pipe filled with Mexico's finest. Our host asked if we'd heard the new Dead album. We shook our heads "no,"and he put it on. Well the first days are the hardest days, don't you worry anymore.... Yeah! I'm alive! After I got the album and listened to it a few times, I decided that "Cumberland Blues," with its bluegrass accents, was my favorite. Hear it above. Poster image: Brooklyn Museum; Wes Wilson. 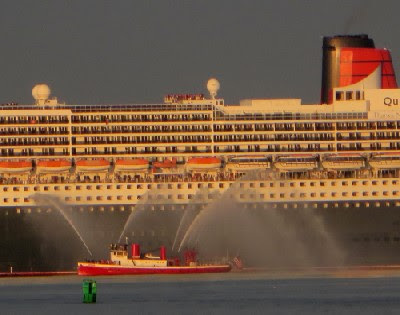 Queen Mary 2 arrives in Brooklyn from England, celebrating 175 years of transatlantic service. In July of 1840 RMS Britannia inaugurated the British and North American Royal Mail Steam Packet Company's transatlantic liner service. That company would later become the Cunard Line. Today, Cunard's Queen Mary 2 commemorated that voyage on its 175th anniversary, arriving at her American home port in Red Hook, Brooklyn after a voyage from Southampton, England. 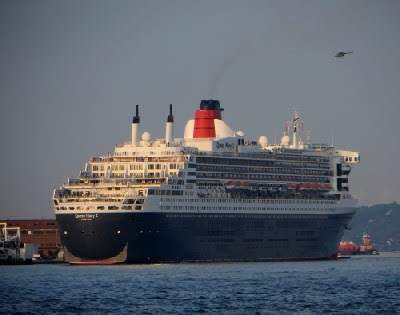 She was scheduled to arrive at 6:00 a.m., and your correspondent got himself to Pier 5 in Brooklyn Bridge Par to watch and photograph her arrival. 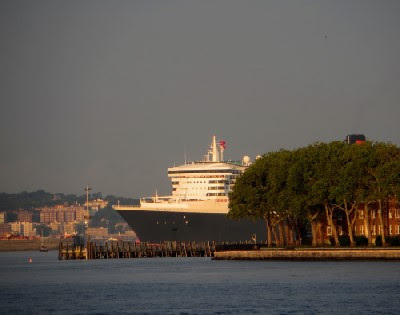 In the photo above, the great ship was beginning to emerge from behind Governors Island. 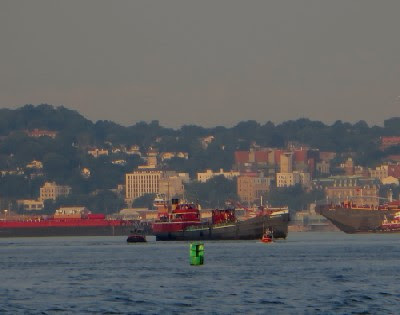 The retired, now privately owned New York City fireboat John J. Harvey saluted Mary as she approached her berth. The enormous ship had to be turned so that she would be berthed with her bow facing toward the sea. Meanwhile, the tug Kings Point was headed outward, as the high speed ferry Finest came in. Here's Mary stern on, with Staten Island, an anchored Stolt tanker, and barges in the background. Among the flotilla of vessels greeting Queen Mary 2 was the historic harbor tanker Mary A. Whalen, now owned by PortSide NewYork, headed by my friend Carolina Salguero. 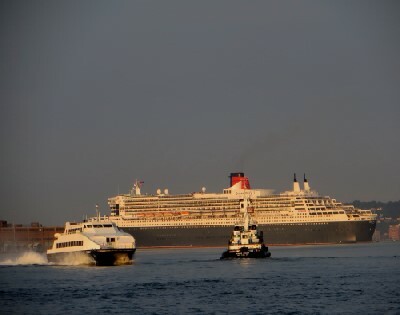 The great Queen approaches her berth, ending an historic voyage. 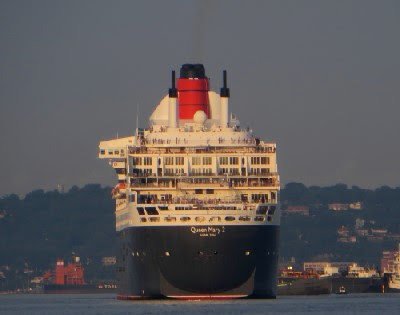 While she is used mostly for cruising, Queen Mary 2 makes a couple of transatlantic voyages each summer, keeping alive a worthy tradition.